The Space Age officially began 53years ago today, when theSoviet Union launched Sputnik, the world's first man-made satellite.While theoriginal event set off fear and Cold War rivalries, today it is honoredwiththe kickoff of an international space celebration. This week, organizations across theglobe celebrate the 11thannual World Space Week, which highlights the contributions of spacescienceand technology to life on Earth. This year's theme is "Mysteries ofthe Cosmos,"and activities include a Google Lunar X Prize Summit on the Isle ofMan, anastronomy festival in Marrakech, Morocco, and a star camp for highschoolstudents in Jeddah, Saudi Arabia. "World Space Week is the time eachyear when the publiccan learn about the many benefits of space exploration, and studentsareinspired through space to excel in school," Dennis Stone, president oftheWorld Space Week Association, said in a statement. "World Space Week isopen to everyone." The United Nations established WorldSpace Week in 1999, andthe event was first held a year later. The U.N. continues to helpcoordinatethe annual celebration, according to the World Space Week Association. World Space Week's start and enddates are the same everyyear. They mark two key events in the history of space exploration: theOct. 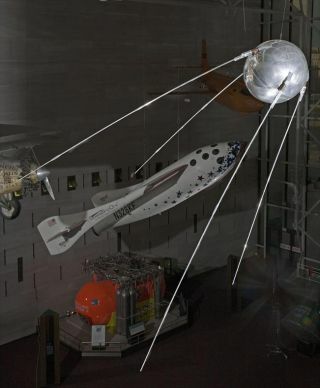 4,1957 launchofSputnik, and the date the Outer SpaceTreaty went into effect on Oct. 10,1967. The Treaty formed the basis for international space law. World Space Week also follows closelyon the heels of NASA's52nd anniversary ? the space agency becameoperational on Oct. 1, 1958. Last year, when World Space Week'stheme was "Space forEducation," 713 events were held in 55 nations, according to officials.President Obama joined in, throwingastar party for middle-school students on the White House lawn. Public astronomy lectures inHelsinki, Finland. The inauguration of a mobileplanetarium and telescopein Thrissur, India. Rocktober skies, a regional rocketlaunch in Alabama. This is a busy week for astronomyevents, and not all ofthem are formally connected to World Space Week. The AmericanAstronomicalSociety's Division for Planetary Sciences, for example, is holding itsannualmeeting Oct. 3-8 in Pasadena, Calif.